First published in 1991. Investigative Pathology of Odontogenic Cysts presents a unique and succinct review of the pathology of odontogenic cysts. 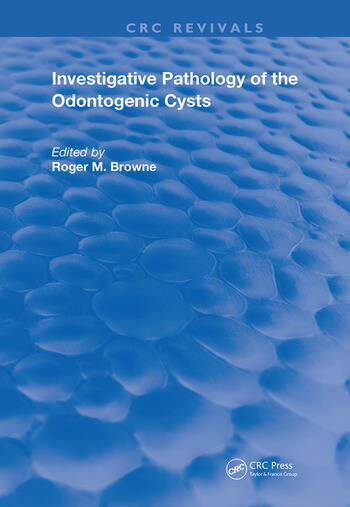 The book emphasizes investigative pathology of odontogenic cysts and uses numerous illustrations and tables to reinforce and summarize discussions presented in the text. The book's most important aspect is its attempt to bring together new information regarding odontogenesis and the pathogenesis of odontogenic cysts. Oral biologists and pathologists working with dental tissues will find this book an important reference resource. The Classification of Odontogenic Cysts (Roger M. Browne). The Structure of Odontogenic Cysts (Roger M. Browne). Odontogenic Epithelium and Its Residues (Anthony J. Smith and John B. Matthews). Pathogenesis of Odontogenic Cysts (Roger M. Browne and Anthony J. Smith). Animal Models of Odontogenic Cysts (Roger M. Browne). Odontogenic Cyst Fluids (Anthony J. Smith). Bone Resorption in Relation to Odontogenic Cysts (Wilson Harvey). Glycoconjugates in Odontogenic Cysts (Anthony J. Smith). Cholesterol in the Walls of Odontogenic Cysts (John R. Garrett and Katherine M.S. Winstone). Hyaline and Foreign Bodies in Cyst Walls (John B. Matthews). Odontogenic Keratocysts in Syndrome and Non-Syndrome Patients (John W. Rippin and Julia A. Woolgar). Basal Cell Nevus Syndrome (Julia A. Woolgar and John W. Rippin). Index..